A123 Helps Power Porsche to Le Mans Victory! Nanophosphate® ANR26650M1-B: The ANR26650M1-B is the next generation of A123 Systems’ pioneering 26650 cylindrical cell, now with greater power and energy density and lower impedance. This versatile lithium ion cell is suitable for a wide variety of applications and system designs. Proven performance in the toughest conditions, combining durability, reliability, and safety, the ANR26650 cell offers an excellent combination of price-performance. 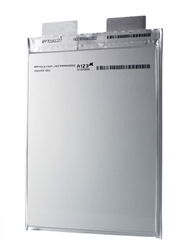 Nanophosphate® AMP20M1HD-A: A123's AMP20 prismatic pouch cell is built to deliver high energy and power density combined. The AMP20 prismatic cell demonstrates industry-leading abuse tolerance coupled with excellent life performance under the most rigorous duty cycles. The AMP20 delivers high usable energy over a wide state of charge (SOC) range to minimize pack oversizing and offer very low cost per watt-hour.